This is moving, Jesus washes the feet of his disciples. Peter understands nothing. He refuses but Jesus explains to him. Jesus, God did this, and He Himself explains it to the disciples.. ‘Do you realize what I have done for you? You call me ‘teacher’ and ‘master,’ and rightly so, for indeed I am. If I, therefore, the master and teacher, have washed your feet, you ought to wash one another’s feet. I have given you a model to follow, so that as I have done for you, you should also do’. 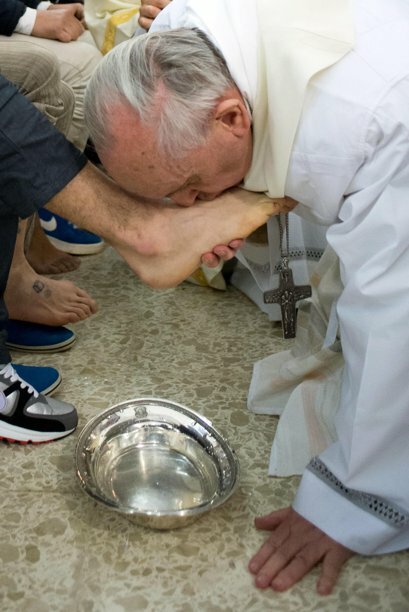 It is the example set by Our Lord, it’s important for Him to wash their feet, because among us the one who is highest up must be at the service of others. 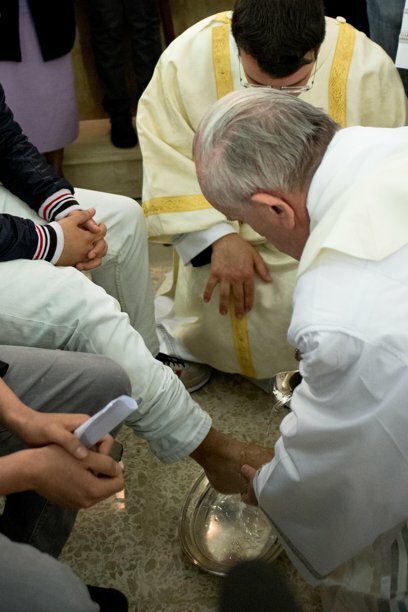 This is a symbol, it is a sign – washing your feet means I am at your service. And we are too, among each other, but we don’t have to wash each other’s feet each day. So what does this mean? That we have to help each other…sometimes I would get angry with one someone, but we must let it go and if they ask a favor, do it! Help one another. This is what Jesus teaches us. This is what I do. And I do it with my heart. I do this with my heart because it is my duty, as a priest and bishop I must be at your service. But it is a duty that comes from my heart and a duty I love. I love doing it because this is what the Lord has taught me. But you too must help us and help each other, always. And thus in helping each other we will do good for each other. Now we will perform the ceremony of the Washing of the Feet and we must each one of us think, Am I really willing to help others? Just think of that. Think that this sign is Christ’s caress, because Jesus came just for this, to serve us, to help us.